Think your cat is uncooperative during a veterinary examination? Image if your cat weighed more than 400 pounds and had three-inch-long teeth and claws! Unsurprisingly, lions, tigers, and other wild cats must be anesthetized before they can be examined closely by a veterinarian. When it’s time for dental care for the residents of the Exotic Feline Rescue Center in Center Point, Ind., anesthesia is provided by Dr. Stephanie Keating, a board-certified anesthesiologist at the University of Illinois Veterinary Teaching Hospital in Urbana, and a team of experienced veterinary technicians, anesthesia residents, and veterinary students. 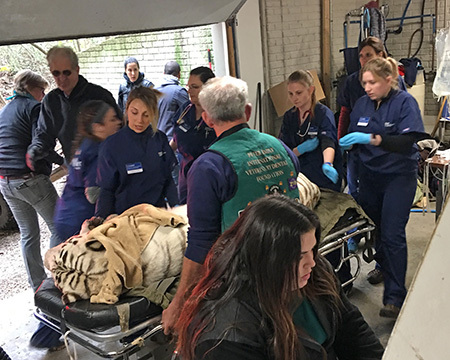 In this image, taken October 29, 2017, Dr. Keating views a sedated tiger that has just arrived at the temporary dental clinic at the Exotic Feline Rescue Center. In the photo at the top she is in the process of transitioning the tiger to inhalation anesthesia by placing an endotracheal tube. On this particular day, in addition to the separate teams of veterinarians and assistants delivering the anesthesia and the dental care, CBS Evening News was also present with a film crew. You can watch the report online. About 200 big cats—tigers, lions, and even jaguars—have a safe home at the center after having been rescued from situations of abuse or neglect. These cats need physical examinations and dental procedures, just like our pet cats do, to ensure their optimal health. The only difference is that big cats must be sedated for close interactions for the safety of everyone involved. Twice a year a team of veterinary volunteers from a variety of organizations visits the rescue center to perform necessary dental procedures. The team may examine as many as 10 cats in one weekend visit. Personnel from the University of Illinois team have been delivering gas anesthesia during these procedures for over 10 years. Veterinary technicians Jessica Risley and Justin Lancaster have been on the anesthesia team for most of that time. “Not every cat will need anesthesia at each visit. The staff at the rescue center keep a close eye on the animals and determine which cats need to be evaluated or have a procedure performed based on changes in their eating pattern or observable dental problems,” Dr. Keating explains. The rescue center has a staff veterinarian who routinely manages the animals’ health and who sedates the cats for other procedures. “Once the cat is successfully anesthetized by the injection, the rescue center staff and anesthesia personnel move into the animal’s enclosure and load it onto a vehicle for transportation to the on-site clinic,” Dr. Keating says. This process requires several people. “We monitor the cat’s heart rate, blood pressure, respiratory rate and efficacy, and anesthetic depth,” Dr. Keating explains. These values are recorded every 5 minutes but monitored continuously. Arterial blood samples are also obtained to evaluate blood gases and electrolytes during anesthesia. The team is looking for any significant change and is prepared to deal with it. “When the exam or procedure is finished, the cat will be moved back into its enclosure to recover. 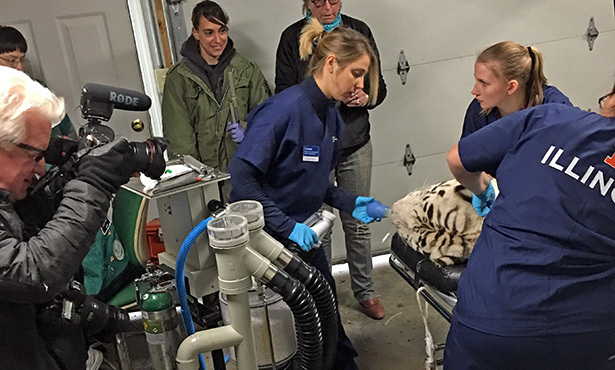 When the cat is sufficiently recovered and positioned safely in the enclosure, we remove the endotracheal tube and continue to monitor them from outside the enclosure,” Dr. Keating says. The animal will be a little groggy but will become ambulatory again after a few hours. If you have questions about anesthesia for animals big to small, contact your local veterinarian.